"The vaquero (Spanish: vaquero or Portuguese: vaqueiro) is a horse-mounted livestock herder of a tradition that originated on the Iberian peninsula. Today the vaquero is still a part of the doma vaquera, the Spanish tradition of working riding. The vaquero traditions developed in Mexico from methodology brought to Mesoamerica from Spain also became the foundation for the North American cowboy. 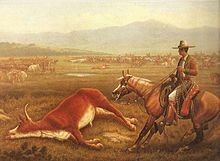 The vaqueros of the Americas were the horsemen and cattle herders of Spanish Mexico, who first came to California with the Jesuit priest Eusebio Kino in 1687, and later with expeditions in 1769 and the Juan de Anza expedition in 1774. They were the first cowboys in the region. In the modern United States and Canada, remnants of two major and distinct vaquero traditions remain, known today as the 'Texas' tradition and the 'Spanish', 'Vaquero', or 'California' tradition. The popular 'horse whisperer' style of natural horsemanship was originally developed by practitioners who were predominantly from California and the Northwestern states, clearly combining the attitudes and philosophy of the California vaquero with the equipment and outward look of the Texas cowboy. The natural horsemanship movement openly acknowledges much influence of the vaquero tradition. The origins of the vaquero tradition come from Spain, beginning with the hacienda system of medieval Spain. This style of cattle ranching spread throughout much of the Iberian peninsula and later, was imported to the Americas. Both regions possessed a dry climate with sparse grass, and thus large herds of cattle required vast amounts of land in order to obtain sufficient forage. The need to cover distances greater than a person on foot could manage gave rise to the development of the horseback-mounted vaquero. Various aspects of the Spanish equestrian tradition can be traced back to Arabic rule in Spain, including Moorish elements such as the use of Oriental-type horses, the la jineta riding style characterized by a shorter stirrup, solid-treed saddle and use of spurs, the heavy noseband or hackamore,...and other horse-related equipment and techniques. Certain aspects of the Arabic tradition, such as the hackamore, can in turn be traced to roots in ancient Persia. The arrival of horses in the Americas was particularly significant, as equines had been extinct there since the end of the prehistoric ice age. However, horses quickly multiplied in America and became crucial to the success of the Spanish and later settlers from other nations. The earliest horses were originally of Andalusian, Barb and Arabian ancestry, but a number of uniquely American horse breeds developed in North and South America through selective breeding and by natural selection of animals that escaped to the wild and became feral. The Mustang (see also Modern Feral Horses) and other colonial horse breeds are now called 'wild,' but in reality are feral horses-descendants of domesticated animals. Mesteñeros were vaqueros that caught, broke and drove Mustangs to market in Mexico and later the American territories of what is now Northern Mexico, Texas, New Mexico and California. They caught the horses that roamed the Great Plains and the San Joaquin Valley of California, and later in the Great Basin, from the 18th century to the early 20th century. ...The Spanish tradition evolved further in what today is Mexico and the Southwestern United States into the vaquero of northern Mexico and the charro of the Jalisco and Michoacán regions. Most vaqueros were men of mestizo and Native American origin while most of the hacendados (ranch owners) were ethnically Spanish. Mexican traditions spread both South and North, influencing equestrian traditions from Argentina to Canada. Mesteñeros were vaqueros that caught, broke and drove Mustangs to market in the Spanish and later Mexican, and still later American territories of what is now Northern Mexico, Texas, New Mexico and California. They caught the horses that roamed the Great Plains and the San Joaquin Valley of California, and later in the Great Basin, from the 18th century to the early 20th century. Distinct regional traditions arose in the United States, particularly in Texas and California, distinguished by local culture, geography and historical patterns of settlement. In turn, the California tradition had an influence on cattle handling traditions in Hawaii. The 'buckaroo' or 'California' tradition, most closely resemblied that of the original vaquero, while the 'Texas' tradition melded some Spanish technique with methods from the eastern states, creating separate and unique styles indigenous to the region. The modern distinction between vaquero and buckaroo within American English may also reflect the parallel differences between the California and Texas traditions of western horsemanship. ..."